Clear braces are a popular choice for adults and teens that would like a discreet alternative to traditional metal braces. Options include clear aligners such as Invisalign® and clear ceramic braces, which use tooth-colored ceramic brackets and wires instead for a nearly invisible look. 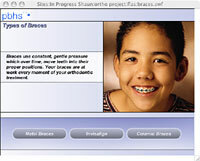 In-Ovation® System Braces – Also called “self-ligating”, these braces do not require elastics or ties, but instead use free-sliding technology to reduce pressure, friction, and treatment time for the patient. If you are interested in enhancing your smile, call us to find out about the many orthodontic options that we offer!